The Song Poet will become the first Hmong story to be adapted into an opera. How exciting! 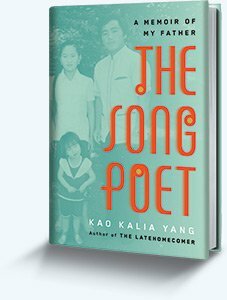 The Minnesota Opera on Monday announced the commissioning of a new work based on the award-winning memoir “The Song Poet” by St. Paul writer Kao Kalia Yang. It tells the story of her family and in particular, her song poet father Bee Yang, as war forces them from Laos into a Thai refugee camp and ultimately on to St Paul. Yang said it’s the first time a Hmong story will be presented as an opera. Kao Kalia’s first interview for A Map Into the World. I was born in a refugee camp in Thailand in December of 1980. I was the runt of the babies born that year in that hungry place, in that uncertain time. Few thought I would survive. The Hmong, my people, had just escaped from the genocide of the aftermath of America’s secret war in Laos. The Central Intelligence Agency of the United States had commissioned thirty-two thousand Hmong men and boys to fight and die on America’s behalf. Most of the soldiers were killed during the war. Many more civilians were slaughtered after the Americans left. I was born to a people who had fled from death and despair in the hopes of a chance at life. I was born on four hundred borrowed acres, funded by the United Nations, surrounded by Thai men with guns, in a place where Hmong people got food three days a week and little girls like me often disappeared in the dark of night. One day my brother said his face felt heavy. His left eye started to water. He wiped away the liquid. He massaged his face. He went fishing with our cousins. When he got home, it was late. The sky was dark. The house was dark. He was quiet coming into the house. He didn’t turn on lights until he got to the bathroom. In the light of the bathroom, he could see that one side of his face looked strange. It appeared to be drooping. He tried to push it up: his eye lids, his cheek, his mouth, but to no avail. Nothing was working on the left side of his face. Instead of waking up our parents or making a scene, he used his hand to help his mouth open, and he brushed his teeth and washed his face, and he went to bed.